The exciting and thrilling trekking within the Himalayas of Nepal, Ganesh Himal Trek bestows with the wide range of unique and undiscovered features which are way astonishing and interesting. 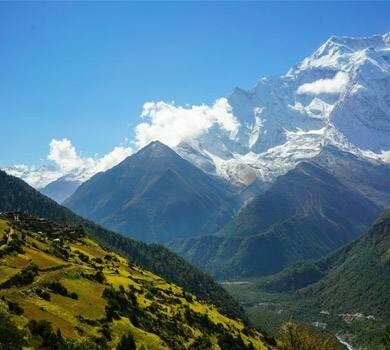 This is the trekking route of Nepal that is located mostly in the central eastern region of Nepal. Ganesh Himal is one of the well-known mountains of Nepal as this mountain is named after Lord Ganesh (A Hindu Deity), whose head is similar to an elephant because Ganesh Himal resembles like an elephant. Yangra (7,422m / 24350 ft) is to be known as the highest peak of the range known as Ganesh I, where there are altogether 14 others peak over 6000 m and 3 peaks above 7000 m. Ganesh Himal Base Camp Trek trail is least explored and yet remain tranquil and untouched by the modernization. Why Ganesh Himal Base Camp Trek? Ganesh Himal Trek offers with the distinct varieties of landscape and vegetation. Trekking route of Ganesh Himal bestows with the wild range of natural treasures. The green lush forest, beautiful terrace hills, grassy meadows, along with diverse topography will make Ganesh Himal Base Camp trek as one of the unique treks in between the Himalayas of Nepal. Ganesh Himal Base Camp Trek nowadays gaining its popularity because it has been successfully delivering the pleasure and heaven like feelings among visitors. There are numerous core structures or features that are playing a major part to make Ganesh Himal Base Camp Trek memorable and worthy one like culture and tradition of local people, their traditional lifestyle, unique vegetation, outstanding view of snow-capped mountains, present of rare species of plants and animals and many more sightseeing. Ganesh Himal Base Camp Trek follows the trail where one can have the opportunities to get touched with the culturally rich and unspoiled ethnic villages, dense green forest with the present of Himalayan flora and fauna where on the backdrop the breathtaking mesmerizing views of Mt. Ganesh, Mt. Langtang and Mt. Manaslu. Ganesh Himal Base Camp Trek starts from Arkhet Bazaar (620 m/ 2035 ft) – reached by the scenic drive from Kathmandu. Crossing through Lapubeshi (884 m/ 2901 ft) and other small villages, follow all the way to beautiful Gurung village of Machhakhola (869 m/ 2852 ft). Chumling (3230 m/ 10598 ft) is one of the best places to have a panoramic view of snow-capped mountains which is reach via several villages like Doban (1070 m/ 3511 ft), Phillim (1570 m/ 5151 ft) and Lokpa (2240 m/ 7350 ft) (these 3 places offer with traditional lifestyle of local people and great views of natural treasures). Gumba Lungdang (3200 m/ 10499 ft) is the last campsite of the Ganesh Himal Base Camp Trek from where following the trail towards the lap of Ganesh Himal (Yangra) (4210 m/ 113813 ft) will be amazing. The box up package of 19 days Ganesh Himal Trek bestow with the perfect combination of natural and cultural aspects. The trek can be customized as per one’s interest and time frame. The weather condition plays a prime role for every trekking route so for Ganesh Himal Trek the perfect time are September to November (Autumn) and March to May (Spring) and also can be enrolled during January, February, and December. Ganesh Himal Base Camp trek is suitable for those who seek to spend their leisure time in between the Himalayas in a group or individually. The team of Massif Holidays will be helping to make the journey or the trek to Ganesh Himal Base Camp remarkable and unforgettable. Scenic drive from Kathmandu-Arkhet Bazaar-Kathmandu. Crossing over Chumling (3230 m). Day 01: Arrive at Tribhuwan International airport (1345 m). Overnight stay at Hotel. Day 03: Drive to Arkhet Bazaar (620 m). About 8 hours. Overnight stay at Hotel. Day 04: Trek to Lapu Beshi (884 m). About 6 hours. Overnight stay at Tea House. Day 05: Trek to Machhakhola (869 m). About 6 hours. Overnight stay at Tea House. Day 06: Trek to Dovan (1070 m). About 5 hours. Overnight stay at Tea House. Day 07: Trek to Philim (1570 m) from Dovan. About 5 hours. Overnight stay at Tea House. Day 08: Trek to Lokpa (2240 m). About 5 hours. Overnight stay at Tea House. 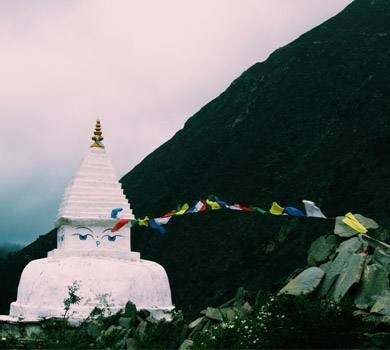 Day 09: Trek to Chumling (3230 m). About 6 hours. Overnight stay at Tea House. Day 10: Rest for acclimatization & Exploring in the Valley. Overnight stay at Tea House. Day 11: Trek to Domje (2460 m). About 5 hours. Overnight stay at Tea House. Day 12: Trek to Gumba Lungdang (3200 m). About 6 hours. Overnight stay at Gumba. Day 13: Trek to Ganesh Himal Base Camp and exploration. Trek Back to Gumba Lungdang. About 6 hours. Overnight stay at Gumba. Day 14: Trek down to Ripchet (2470 m). About 7 hours. Overnight stay at Homestay. Day 15: Trek down to Phillim. About 7 hours. Overnight stay at Tea House. Day 16: Trek down to Tatopani (990 m). About 7 hours. Overnight stay at Tea House. Day 17: Trek down to Soti Khola (700 m). About 7 hours. Overnight stay at Tea House. Day 18: Drive back to Kathmandu from Soti Khola. About 8 hours. Overnight stay at Hotel. Basic Teahouse accommodation during Ganesh Himal Base Camp Trek. Professional license holder English speaking Trekking Guide (if required with other nation’s dialect for Ganesh Himal Base Camp Trek). Manaslu trekking permit and TIMS permit for trekking. Scenic drive from Kathmandu – Arkhet Bazaar – Kathmandu and also fare of private transport (in Kathmandu).